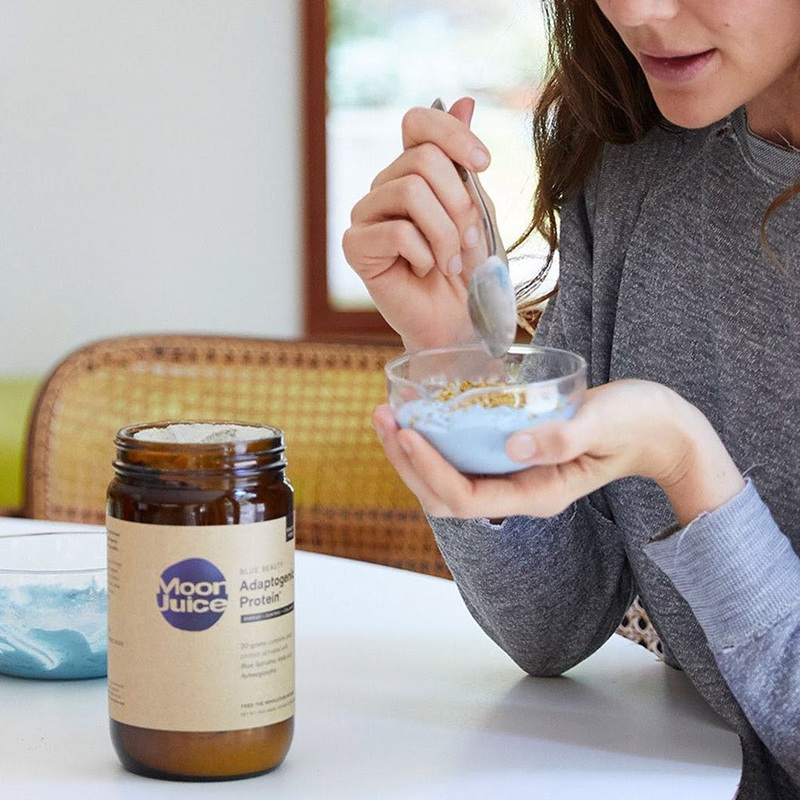 Moon Juice's Blue Beauty Adaptogenic Protein blends bio-fermented brown rice protein with adaptogens like Ashwaganda, Amla and Blue Spirulina, to balance the mind and body, regulate stress-related weight gain, boost energy, encourage collagen preservation and support skin elasticity. Brown rice protein is an easily digestible, source of protein so it's a great way to get protein into a vegan or restrictive diet. Ashwaganda is an ancient herb that supports immune health, reduces cortisol levels in the body to regulate stress, and calms inflammation. Amla, also known as the "beauty berry", helps to preserve collagen and skin elasticity, and reduce damage from free radicals. And last but not least, the blue beauty itself, Blue Spirulina. Blue Spirulina is an algae that's high in vitamins B & E, beta-carotenes, minerals and antioxidants, it boosts energy, detoxes the body and helps to balance gut flora. Mix it in with your smoothies, pancakes, or try the blue bowl recipes below!